In an interview with Outlook Turning Point magazine ,King Khan aka Shah Rukh Khan has created a controversy by stating that his ‘being Muslim’ ,post 9/11, has made him a target of few political leaders and that rallies have been held in the past where he has been asked to leave his home and return to his original homeland, indicating Pakistan.He also mentioned such issues forced him to make the movie ‘My Name Is Khan(and I’m not a terrorist)’. 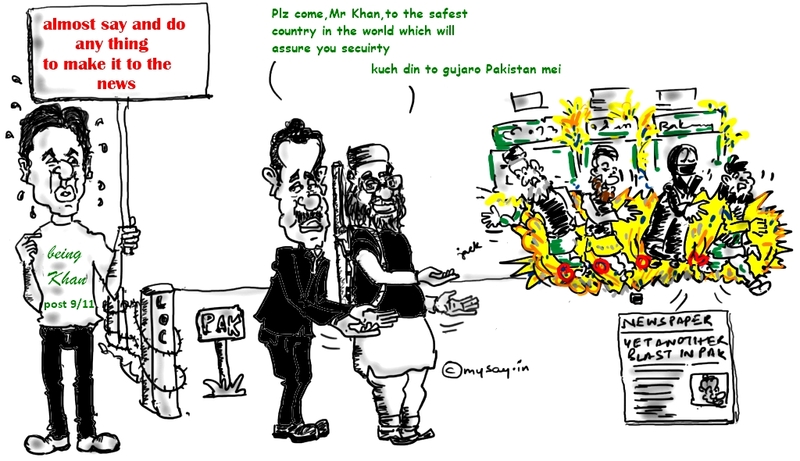 The controversy fueled up when Pakistan’s,Interior Minister,Rehman Malik stated that India should give security to Shah Rukh Khan while, Hafiz Saeed,India’s most wanted terrorist for Mumbai 2008 terror attack , stated Shah Rukh Khan can very well come and live in Pakistan and that he would make all the arrangements . Look who is talking ? Should Mr Malik rather not sort out his country’s security issues where bomb blasts are a daily business before asking India to give security to Shah Rukh ? And is Hafiz Saeed,a terrorist, also a Pakistani Minister to offer people relocation assistance in Pakistan ? Well, is it not astonishing to hear Shah Rukh Khan complain ? Is he not the actor who tops the charts of Bollywood Heroes since over a decade now (thanks to his fans ,majority of whom are logically non-Muslims)? Do his fans give a second thought about whom he prays before being his mad fans ? When has he been questioned for being a Muslim , in India(American airport is not in India where he was held) ? And whenever and if ever he has been targeted by political parties for ‘being Muslim’ ,is he the only Bollywood Star who has been targeted for political mileage (publicity stunt)? Even Amitabh Bachchan has been targeted for being a North Indian . There is no denying that artists have been soft targets for Indian Political Leaders but this is not restricted to any religion or caste. This happened to Salman Rushdie,Ashis Nandy,Deepa Mehta,Tasleema Nasreen, Amitabh and Aamir and so many more. Is he the only one who has been targeted ? Then why making a fuss about it ? Bollywood actors have been respected by the Indian society regardless what religion they follow and what caste they belong to and Shah Rukh Khan himself is one of the biggest example of such respect and love.